When My family came to visit a few weeks ago, my Mom brought some of her amazing home canned peaches. They were so good. We ate them up in just a couple of days, but were left with a jar of light syrup. When I made pancakes for breakfast I was sad that the peaches were all gone, and then I wondered what the pancakes would taste like with the peach syrup. Wow! 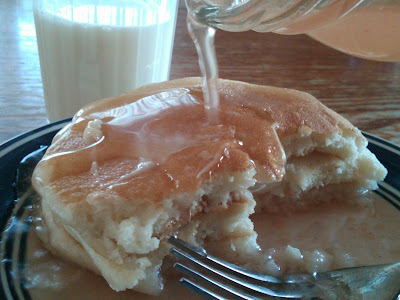 I put a little butter and poured on the peach syrup (and got a little carried away). It was Sooooo good! Thanks Mom!!! Now I need your recipe for your canned peaches! Yummy! My kids love this too. Now when are you going to post the pumpkin muffins?? They were soooo good and I've been dying to bake them!